RentWisconsinCabins.com is celebrating our 7th year, and for the 7th year in a row, we are proud to sponsor Fishing Has No Boundaries. They are rooted in Wisconsin, but have now expanded their cause to 11 states. 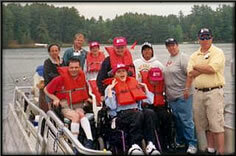 FHNB are a non-profit 501-C3 organization whose goal is to open up the great outdoors for people with disabilities through the world of fishing. RentWisconsinCabins.com Featured in Madison Magazine. Spreading the word about the hundreds of irresistible vacation rentals that dot our Wisconsin landscape. Wisconsin State Journal/Business: Featured Article. Sites that connects cabins with customers continues to grow. Looking to compare vacation rentals outside of Wisconsin? Cabin Rentals MN Plan and book directly with Minnesota rental owners or managers. Michigan Cabins and Cottages Plan and book directly with Michigan rental owners or managers. New York Vacation Rentals Plan and book directly with New York rental owners or managers. Montana Cabin Rentals Plan and book directly with Montana rental owners or managers. Tennessee Cabin Rentals Inquire and book directly with Montana rental owners or local managers.